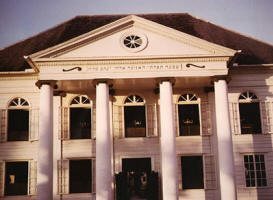 The Neveh Shalom Synagogue of Paramaribo was founded on Keizerstraat in 1716 and inaugurated in 1723. It was a wooden structure erected under the guidance of master carpenter Abraham van Edam (c.1675-1724). The original building underwent a series of renovations, most notably in 1780 when it was enlarged for accommodating a total of 200 seating places in the men’s section. The synagogue was completely rebuilt from 1835 to 1842 according to the plans of the architect Jan Francois Halfhide and replaced the earlier building of the Neveh Shalom synagogue. The construction work started on July 3, 1835, in the presence of Prince Willem Frederik Hendrik (1820-1879), the son of King Willem II of the Netherlands, as is stated on a commemorative plaque inside the building. There is no exact date known for the beginnings of Jewish settlement in Paramaribo, which was then part of colony of Dutch Guiana in South America. It is generally assumed that the first Jews settled in the town already in the late 17th century as they did in other parts of the country where they enjoyed the religious tolerance of the Dutch authorities. Neveh Shalom was probably not the first synagogue in Paramaribo; other synagogues, no longer existing, were opened in different places of Jewish settlement in the Dutch Guiana, most notably in the plantations near the Cassiepoera Creek, later known as the Joden Savanne (“The Jewish Savanna”). 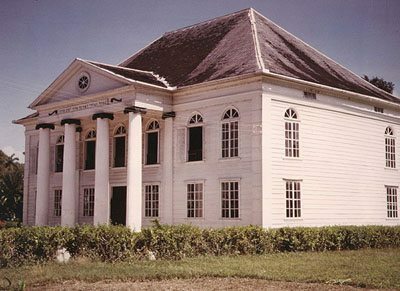 The Neveh Shalom (“Home of Peace”) synagogue was initially intended to serve all Jews in Paramaribo, then a small village established near Dutch-controlled Fort Zeelandia. However, one year after its inauguration, a conflict between the Portuguese Jews and the Ashkenazi Jews, the majority of whom came to Surinam from Rotterdam in the Netherlands, led to a split in the local community. The building of the Neveh Shalom synagogue was purchased by the Ashkenazi Jews in 1735 who had by then set up their separate community known as the Hoogduitse Joodsche Gemeenschap (“The German Community”), while the Portuguese Jews opened their own synagogue called Zedeq ve Shalom (“Justice and Peace”) in 1736. The Neveh Shalom synagogue continued to serve the Ashkenazi community of Paramaribo, until the late 1990’s, when, following the closure of the Zedeq ve Shalom Portuguese synagogue, it remained as the only functioning synagogue in Paramaribo, serving all members of the local community as well as visitors. The Neveh Shalom synagogue is a two storey building and at the time of its inauguration was one of the largest and most impressivebuildings in Paramaribo. The entrance to the synagogue is located on the south side of the building and is dominated by a four pillar portico upon which is carved a Hebrew inscription “שמעה תפילתי האזינה אלוקי יעקב סלה” (“Hear my prayer: Give ear, O God of Jacob. Selah.” Psalm 84:9). The building is 25 meters long and about 16 meters wide. The plan of the synagogue is based on that of Great Portuguese synagogue in Amsterdam. Following the local Surinamese custom, the interior walls and columns are painted in white and along with the large windows on all four walls contribute to the bright atmosphere inside the prayer hall that contrasts sharply with the dark colors of the Holy Ark and the bimah. The Holy Ark, an impressive carved wooden structure, is located on the eastern wall. It is accessed from a number of steps dwarfed by two semicircular balustrades located on either side. 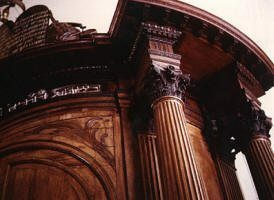 The Baroque-style cabinet is topped by the Tablets of the Law. The bimah, also an exquisitely carved structure, is situated at the center of the prayer hall, closer to the western wall. A separate elevated pulpit of carved wood is located in the eastern part of the prayer hall, just in front of the Holy Ark. The pulpit is roofed by a wooden covering hanging from the ceiling. There are a number of impressive brass chandeliers in the prayer hall, some suspended, others standing on the floor or on the bimah. Several chandeliers date from the 18th century and come from the earlier synagogue building. Two rows of columns support the women’s galleries on the southern and northern walls. The balconies are accessed from two separate stairs located at the corners of the western wall. 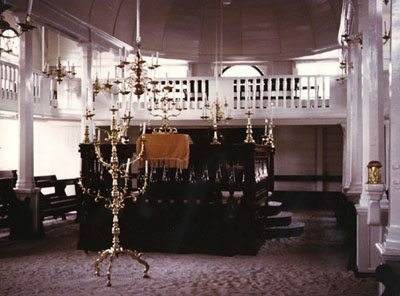 As in other synagogues in the Caribbean, most notably the Snoa synagogue in Curacao and the synagogue in St. Tomas, US Virgin Islands, the floor in both men’s and the women’s sections of the Neveh Shalom synagogue is covered by sand. According to local tradition, this custom was symbolic of the temporary status of the Jewish people in the Diaspora waiting for their return to the Land of Israel, just like the ancient Children of Israel wandered for forty years in the desert before entering the Promised Land. A mikveh (ritual bath) is located in a separate small building in the courtyard of the synagogue.